We recently enjoyed having the family all together for the holidays. I tend to go a little overboard with my holiday baking and usually bake enough Christmas cookies so that I can continually refill my cookie tray as it empties out each day. This year my cookies lasted the entire holiday season, and when the last of my family left, I only had a few broken cookies left that I tossed. Although I do not recommend indulging on sweets every day of the year, I think there is no reason that we cannot enjoy a cookie or two on special occasions. To balance out any sugar rushes that might take place, I try and have some healthy snacks on hand, and we do try and eat healthy most meals. I always keep fresh fruit in the refrigerator and have whole grain pretzels and crackers available in my pantry. 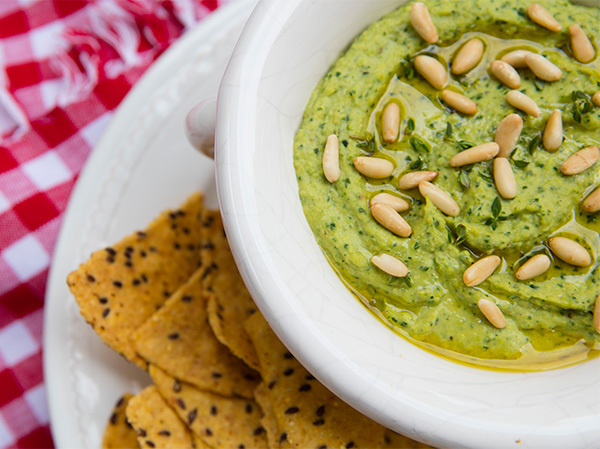 This year, while the family is busy playing board games or splashing in the pool, I threw together a few healthy snacks for the family to enjoy including this tasty hummus dip made with kale. This dip is a lovely color, and even the pickiest of eaters will never know that there is kale in it. 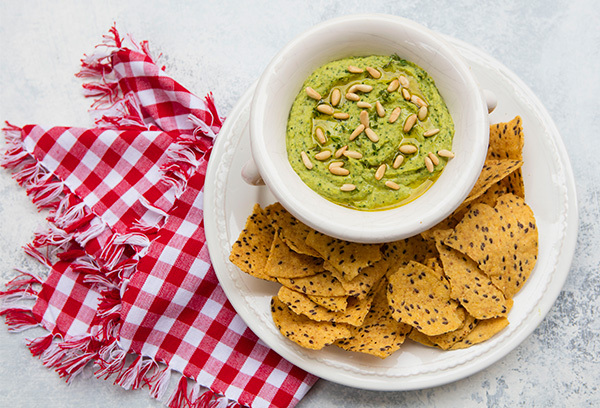 The flavor is subtle yet delicious, and you can serve this dip with whole grain tortilla chips such as I did, or serve it with crudités such as carrot and celery sticks alongside small cauliflower and broccoli florets. 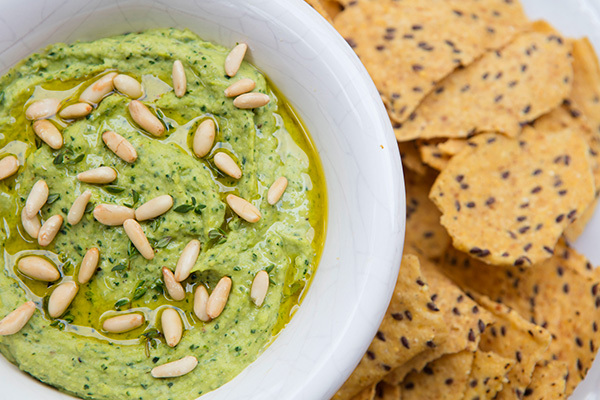 If you prefer, you could use spinach in place of the kale, and garnish it with some lightly toasted pumpkin seeds or other nuts in place of the pine nuts. Boil the kale in lightly salted water until tender. Drain, and place the kale in an ice water bath. In a food processor, add the kale, chickpeas, tahini, lemon juice, garlic, and fresh herbs. Add 1/3 cup of olive oil and puree until smooth, adding a little water if the mixture is too thick. Scoop the dip into a bowl and arrange on a platter with either whole grain tortilla chips or fresh veggies.